With spring in full swing and Father's Day around the corner, Tastykakes is delighted to introduce their newest limited edition spring offerings -- Strawberry Mini Donuts, and Lemon, Cherry and Strawberry Kandy Kakes! These sweet treats are an easy, inexpensive way to enjoy springtime favorite flavors and show the father in your life just how much their sweetness means to you! 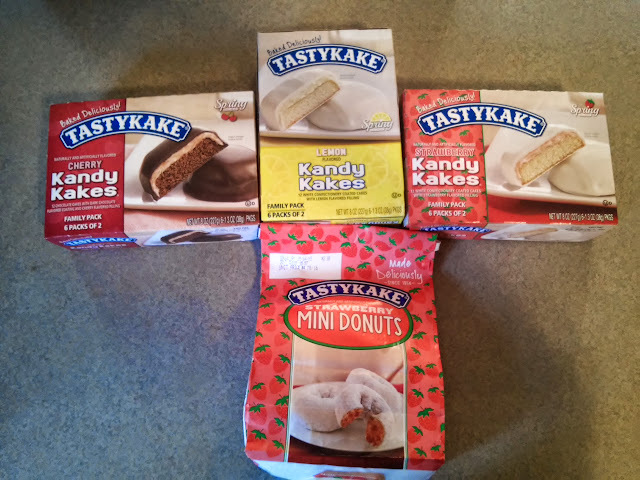 A snack favorite since 1914, Tastykake offers a complete line of snack cakes, pies, cookies, and donuts available in supermarkets and other retail outlets throughout the East, Southeast, and Southwest. Celebrated for their freshness and quality, the brand offering includes such classics as Krimpets, Kandy Kakes and Juniors, and new hits like Kandy Bar Kakes. One taste of a Tastykake and you’ll know why they have been a favorite of many for more than 100 years. Tastykake's new Strawberry Mini Donuts transform strawberry flavor into a mini donut form, featuring a strawberry flavored donut with traditional powdered sugar coating. New Lemon Kandy Kakes feature white coated vanilla sponge cake with a lemon creme filling. Cherry Kandy Kakes feature dark chocolate covered chocolate cake with a cherry creme filling. Strawberry Kandy Kakes feature white coated vanilla sponge cake with a strawberry creme filling. My husband loves to enjoy Tastykakes with his coffee and was excited to try these new flavors! If you husband is like mine, these definitely make a great Father's Day gift! You can purchase Tastykakes at your local retailer.